Eat pasta, enjoy wine and lose weight! The Mamma Mia! Diet brings the health benefits of a Mediterranean-style program with Italian flair and flavor. It is authentic, effective, delicious and fun. The Mamma Mia! Diet is more than just a meal plan—it’s a complete lifestyle guide. Based on an improved version of the classic Mediterranean diet, the Mamma Mia! Diet provides you with modernized versions of healthy Italian dishes to help you lose weight while still feeling full and satisfied. The Mamma Mia! Diet is the modern Italian diet program that lets you enjoy the best of what Italian fare has to offer--absolutely guilt-free! Benefits of The Mamma Mia! Diet include weight loss, diabetes management, cardiovascular health and longevity. The Italian expression "Mamma mia!" denotes surprise such as "Mamma mia! I am eating good food, drinking wine, losing weight and feeling great!" The Mamma Mia! Diet shows that this is possible. • DOCTOR RECOMMENDED. Based on the time-tested Mediterranean diet, combined with a modern twist, The Mamma Mia! Diet gives you everything you need to make lasting lifestyle choices leading to better health, higher energy levels, and increased longevity. • ENJOY WHAT YOU EAT. Each meal is specifically crafted with three guiding principles in mind: achieving maximum nutritious value, maintaining the authentic taste of real Italian cuisine, and providing satisfying, filling portions that will leave you feeling energized all day long. • EASY-TO- FOLLOW. Every meal featured in The Mamma Mia! Diet can be made quickly and easily using commonly found foods, requiring no special skills. 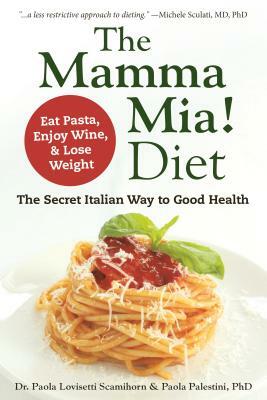 Based on the well-tested, tried and true Mediterranean diet, with Italian flavor and foods, The Mamma Mia! Diet is a healthy weight loss diet everyone can enjoy! Paola Lovisetti Scamihorn is an Italian pharmacist, researcher and food writer with particular attention to healthy eating. Cooking, eating healthy food and staying active have always been her life-long passion and way of life. She has a cooking blog "Passion and Cooking" and contributes to several international magazines. She has previously published in Italy Love is Eating, focusing on Italian culinary culture. Paola Palestini is a biochemistry professor at the Medical School of the University Milano-Bicocca, Italy. She is the coordinator of the Masters in Nutrition and Applied Dietetic programs in addition to teaching in many degree courses including medicine, physiotherapy, nursing, nutrition, and neurology. Recently, Paola has been actively involved in the promotion of the principles of a healthy diet through conferences and in collaboration with several magazines. She is the author of seventy-six scientific articles published in international journals.